UrbanSpoon, a restaurant recommendation service, started out with a simple plan. It was three former Jobster employees, Ethan Lowry, Adam Doppelt and Patrick O’Donnell who set out to see if they could build a company in today’s world without needing any traditional outside investments. Today, they can safely say they succeeded — big time. IAC, the Internet giant, has just bought the completely self-funded company. UrbanSpoon first popped up on IAC’s map when it began pulling in Citysearch reviews to serve up to customers. IAC was impressed with the local audiences UrbanSpoon was able to attract, Lowry says. The two sides had been talking informally on and off starting in the second half of last year. Coincidentally, this was right around the time when the iPhone 3G and Apple’s App Store launched. I mention those because they were really the catalysts that catapulted UrbanSpoon into the spotlight. 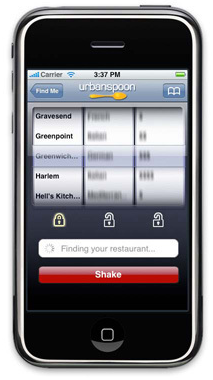 Actually, UrbanSpoon was one of the first iPhone 3G-specific apps I ever looked at because I thought it made interesting use of the device’s GPS chip. When you start up the app, it locates you via GPS, then you shake the phone and it comes up with a random restaurant near you. You can tailor these searches to be more or less random, but it’s so simple and turns indecision into a form of entertainment and discovery. Others clearly agreed as UrbanSpoon was a mainstay in top downloads area of the App Store, and Apple even thought enough of it to use in one of its commercials. Lowry and the rest of the team will stay intact with the move to IAC, and will keep UrbanSpoon based in Seattle. They still have plenty of things in the pipeline, including updates to the iPhone app, but given IAC’s wide range of properties from the aforementioned Citysearch, to Ask.com, to Match.com to Evite, there are a lot of potential new things that UrbanSpoon can delve into now.